Yossi Milo Gallery is pleased to announce “Register,” an exhibition of color photographs by Danish artist Torben Eskerod. The exhibition opens with a reception for the artist from 6:00-8:30 p.m. on Thursday, September 5 and closes on Saturday, October 12. 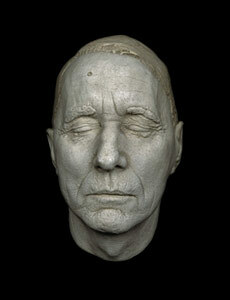 “Register” consists of large-format color photographs of life masks from the collection in Fredericksborg Castle, Denmark. All of the plaster masks in the exhibition were made in the 1940s by Holger Winther, a prominent dentist who made casts of other members of Danish society. The exhibition thus includes masks of famous Danes (e.g., Niels Bohr, the physicist; Johannes Jensen, the 1944 Nobel Laureate in Literature; Karen Blixen, the author of Out of Africa and other works) and less well-known individuals. Eskerod, however, is less concerned with the identity of the mask's subject and more focused on the expressive potential of the human face. The title “Register” refers to the way that the face acts as an external indicator of emotions. Eskerod's portraits of the life masks are only one aspect of the artist's work involving the human face, and the exhibition will also include contrasting photographs by Eskerod of living individuals. In 1997, Eskerod published his first book, Ansigter (Faces), which won the Danish Ministry of Culture Prize for Best Photographic Book, and he has been accepted to show three times at the John Kobal Portrait Awards Exhibition at the National Portrait Gallery in London. Eskerod has received grants from such bodies as the Danish Arts Foundation, the Danish Contemporary Art Foundation, and the Hasselblad Foundation. Torben Eskerod's photographs—including images from this show—were exhibited in 2001 at the Ny Carlsberg Glyptotek in Copenhagen. Mr. Eskerod's work appears in the collections of the National Portrait Gallery in London, Museum of Fine Art in Houston, Kiyosato Museum of Photographic Art in Japan, as well as in Denmark's National Museum of Photography, Museum of Photographic Art, Royal Library, and Museum of National History at Frederiksborg Castle. Born in 1960, Mr. Eskerod resides in Copenhagen. “Register” is his first solo show in New York.